[New for 2013, short lived] Ok, these have been hanging out in the basement freezer awhile now because I was very much afraid that they would be as terrible as the new Hood (fake-klondike) bars. Thankfully, they are not. So there are really only two pieces to this puzzle. First is the ice cream. It's a soft filling with decent vanilla flavor. I'd love a bit more flavor to it, but it's acceptable as is. I'm not expecting the world here, I just need something worth covering. The other piece of the puzzle is the chocolate, and while I would like to see them not skimp on the bottom coating, overall it to is a decent thing. It's got a mild flavor reminiscent of a hollow chocolate bunny. The problem is that it's thin, so there's not a ton of flavor coming from it. There's enough coating to complete the treat, but it's not going to cure any kind of chocolate craving. It also doesn't have that klondike kick to it that I love, but like I said, it'll due. Yes, I actually put it next to the terrible Hood version before digging in. You can see the Friendly's version has a lot more bulk to it, maybe 40% thicker? I actually tried a bite of the Hood for comparison and I still despise it's cheap, terrible tasting existance. So recapping, it's no Klondike, but it's a decent treat if you want something different. Don't be afraid to pick them up. With any luck, they'll do well and Friendly's will start filling them with some of their more interesting ice cream flavors. On Second Scoop: nothing wrong with these, just doesn't have that special Klondike chocolate that I've grown on up. Here's hoping to more varied flavors in 2014! Over the years, it seems to me Klondike has started to skimp on the bars, so it's interesting to me, how superior they still are when compared to other brands. Some brand needs to come in and just knock it out of the park! Maybe it's regional, but I found the Alpine bars to be superior to Klondike in every way. While Klondike's switched to low calorie (read: tasteless) Vanilla ice cream Friendly's uses their great tasting vanilla ice cream. Where Klondike's coating has that obviously fake chocolate taste Friendly's bars have a good chocolate taste to their coating. Ummmm, regional? Friendly's is only east coast, and I live in their home state. Klondike isnt as good as it use to be, I won't argue that, but I still prefer Klondike to these. 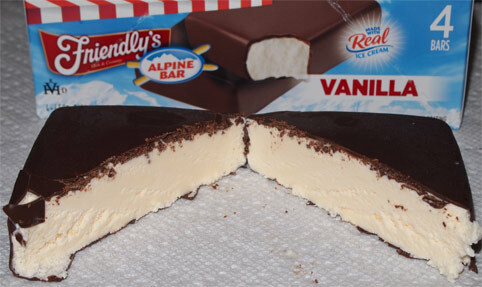 I've seen most of the new 2014 Friendlys treats but I haven't spied any new Alpine flavors yet which is where I think the really money (and difference) is to be made. I meant maybe Klondikes taste better in certain areas than others, I don't know. I haven't really liked them much recently due to the obvious poor quality taste I mentioned, and the introduction of the Magnum bars in America. It's true Klondike has more flavors, but that doesn't really help it since they all have quality issues. oooooooo, my bad. klondike definitely isnt the klondike of 20-30 years ago, but neither is breyers (blame unilever!). magnum is excellent, have you tried talenti bars yet? good stuff, blue bunny is nice too. No, I haven't, thanks for suggesting them! I don't remember seeing Talenti in stores, but I'll check again and I've been wondering about Blue Bunny. Friendly's is also Ohio too!! In my opinion, the Klondike bar chocolate is too thin. While good, there's just not enough of it. 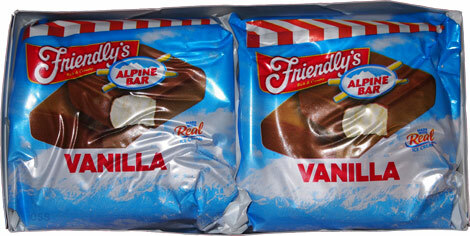 The Friendly's product seems to have a little more chocolate coating so for that reason I go for it over Klondike.